Ten-year-old Ben Fox has good friends, a great dog, and a lightning-fast little sister who drives him a bit batty. The only thing in the fifth grader's life that's truly annoying--well, besides having to wear braces on his feet every day--is the family's wily Siamese cat, Percy. Ben has always suspected something was off about Percy, who has never shown him or his beloved dog, Captain Sparkles, much affection. But now he's sure something is off--Percy has raised an army of squirrel zombies in the backyard and they're ready to take on the dog. 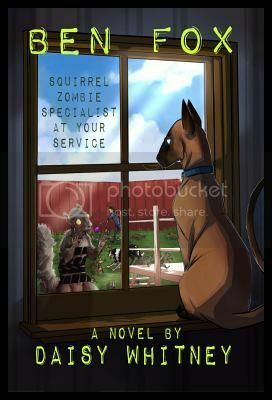 It'll be up to Ben to figure out how to stop the dastardly cat before the dog falls prey to the feline's nefarious plans, especially since Percy and his newly reanimated squirrel friends are gunning for nothing less than a full-scale Animal Zombie Apocalypse--when all the dogs start to behave like cats. Today we welcome Daisy to the blog for an interview. Great to have you with us today, Daisy! When I was in high school I wanted to be a Broadway star. One three things got in the way of that dream. 1, I can't sing. 2, I can't act. 3, I can't dance. That completely depends on the book, but usually one month to four months at the most. Great question! I think themes stem from the story and the characters. As I write, I focus on the plot and the characters and from there the theme often emerges. As much as I can each day! A deep, emotional connection to the characters, clever dialogue, and ample twists and turns. I write under a pen name as well, and have written more than 20 novels total. Under this name, I have published six. My favorite, of course, is Ben Fox!! I'm quite fond of Ben Fox and his menagerie of pets. Wherever I am! I usually write at home, but I've been known to write at the park, on airplanes, in cafes, at conferences, at fencing tournaments and more! My kids are very excited about Ben Fox since it's for middle schoolers! I like to spend time with my family and my dogs, watch movies, and find interesting, quirky coffee shops to check out. Write, revise, edit. Do it again and again and again. Harry Potter is genius and my favorite book ever. I have a number of new books in the works. Stay tuned! Thanks so much for joining us. It was fun getting to know you better!